Welcome to my stop on the Fins, Wings, and Other Things blog tour, brought to you by Peachtree Press! Be sure to check out the complete schedule at Peachtree's Blog! Happy Earth Day! It's my pleasure to review a great Earth Day title for you today! 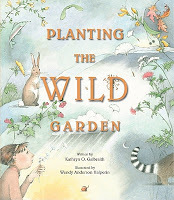 Planting the Wild Garden by Kathryn O. Galbraith, illustrated by Wendy Anderson Halperin. Ages 4-8. Peachtree Press, April 2011. Unpaged. Review copy provided by publisher. As the weather warms, maybe your thoughts turn to gardening. You get out your garden gloves, your trowel, your seeds, your watering can... but how are flowers and trees planted in the wild? There are lots of "gardeners" in the meadow! The wind blows seeds, birds and animals spread seeds in their droppings, rain washes seeds to new places, animals carry seeds on their coats, and even people spread seeds without knowing it! Carefully chosen words describe how animals and forces of nature help to spread seeds and plant the wild garden. I especially love the rich vocabulary, so important in books for young children. We get words like "bobbles", "splatter", "lodge", and "tangle" in addition to the animal and plant words that already make this a vocabulary-rich book. The delicate and detailed illustrations give kids lots to pore over. Smaller inset pictures depict the growth of plants or show different kinds of burrs or show how birds extract seeds from certain flowers. These are a neat addition, presenting additional information from what's in the text. Endpapers show tons of different kinds of seeds. I do wish that there were more notes on the illustrations. Tiny labels telling what plant each seed comes from would have added greatly to the informational value. A bibliography is included, which gives kids a good start if they're looking for more information about seeds. This book will make a great addition to units on plants, gardens, or seeds and it would be a great book to read before taking a nature hike! 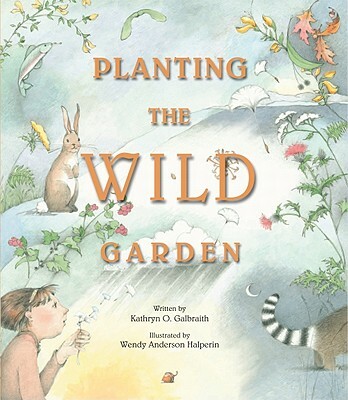 Planting the Wild Garden is on shelves now! And be sure to check out today's other stops on the tour: Wendy Anderson Halperin has a guest post at Satisfaction for Insatiable Readers, a review of About Habitats: Grasslands over at There's a Book, and a review of A Place for Fish over at A Word's Worth.